Trumpville | Flickr - Photo Sharing! The largest building in Monmouth sits empty on Division Street. Monmouth Township is home to 576 people, about half of whom live in the communities of Baldwin and Monmouth. 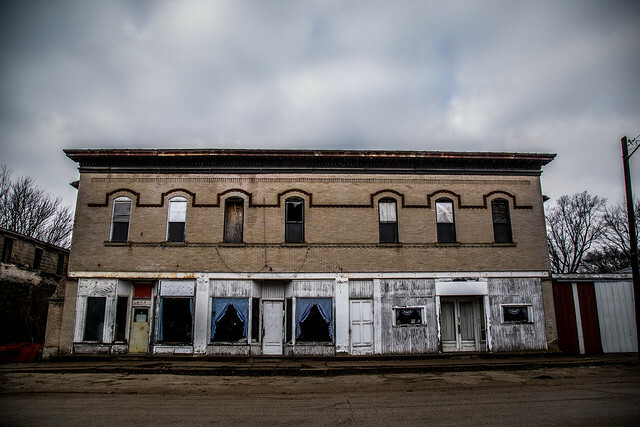 Located in Jackson County in eastern Iowa, it was home to reliable Democratic voters. Barack Obama received around 60% of the vote in both 2008 and 2012 while both John Kerry and Al Gore earned more votes than George W. Bush. In 2016, Donald J. Trump received 64% of the vote in this small township. These photos are from a walkabout of Baldwin and Monmouth less than 48 hours after Trump was sworn in as President of the United States. ag Art and backbeatb00gie added this photo to their favorites. Stunning work on this series of photos.